A matching is a subset of the edges of a graph such that no two edges share a common vertex. Two different matchings in the same graph are illustrated below (edges in the matching are colored blue.) The matching on the left is a maximal matching, meaning that its size can't be increased by adding edges. The matching on the right is a maximum cardinality matching, meaning that is has maximum size over all matchings in the graph. Both edmonds_maximum_cardinality_matching and checked_edmonds_maximum_cardinality_matching find the maximum cardinality matching in any undirected graph. The matching is returned in a MateMap, which is a ReadWritePropertyMap that maps vertices to vertices. In the mapping returned, each vertex is either mapped to the vertex it's matched to, or to graph_traits<Graph>::null_vertex() if it doesn't participate in the matching. If no VertexIndexMap is provided, both functions assume that the VertexIndexMap is provided as an internal graph property accessible by calling get(vertex_index,g). The only difference between edmonds_maximum_cardinality_matching and checked_edmonds_maximum_cardinality_matching is that as a final step, the latter algorithm runs a simple verification on the matching computed and returns true if and only if the matching is indeed a maximum cardinality matching. An alternating path through the matching M exists if and only if M is not a maximum cardinality matching. Repeatedly find an augmenting path and use it to increase the size of the matching until no augmenting path exists. Verify that the matching found is a maximum cardinality matching. If you use checked_edmonds_maximum_cardinality_matching or edmonds_maximum_cardinality_matching, all three of these steps are chosen for you, but it's easy to plug in different algorithms for these three steps using a generic matching function discussed below - in fact, both checked_edmonds_maximum_cardinality_matching and edmonds_maximum_cardinality_matching are just inlined specializations of this function. When quoting time bounds for algorithms, we assume that VertexIndexMap is a property map that allows for constant-time mapping between vertices and indices (which is easily achieved if, for instance, the vertices are stored in contiguous memory.) We use n and m to represent the size of the vertex and edge sets, respectively, of the input graph. empty_matching: Takes time O(n) to initialize the empty matching. greedy_matching: The matching obtained by iterating through the edges and adding an edge if it doesn't conflict with the edges already in the matching. This matching is maximal, and is therefore guaranteed to contain at least half of the edges that a maximum matching has. Takes time O(m log n). extra_greedy_matching: Sorts the edges in increasing order of the degree of the vertices contained in each edge, then constructs a greedy matching from those edges. Also a maximal matching, and can sometimes be much closer to the maximum cardinality matching than a simple greedy_matching. Takes time O(m log n), but the constants involved make this a slower algorithm than greedy_matching. edmonds_augmenting_path_finder: Finds an augmenting path in time O(m alpha(m,n)), where alpha(m,n) is an inverse of the Ackerman function. alpha(m,n) is one of the slowest growing functions that occurs naturally in computer science; essentially, alpha(m,n) ≤ 4 for any graph that we'd ever hope to run this algorithm on. Since we arrive at a maximum cardinality matching after augmenting O(n) matchings, the entire algorithm takes time O(mn alpha(m,n)). Edmonds' original algorithm appeared in , but our implementation of Edmonds' algorithm closely follows Tarjan's description of the algorithm from . no_augmenting_path_finder: Can be used if no augmentation of the initial matching is desired. maximum_cardinality_matching_verifier: Returns true if and only if the matching found is a maximum cardinality matching. Takes time O(m alpha(m,n)), which is on the order of a single iteration of Edmonds' algorithm. Why is a verification algorithm needed? Edmonds' algorithm is fairly complex, and it's nearly impossible for a human without a few days of spare time to figure out if the matching produced by edmonds_matching on a graph with, say, 100 vertices and 500 edges is indeed a maximum cardinality matching. A verification algorithm can do this mechanically, and it's much easier to verify by inspection that the verification algorithm has been implemented correctly than it is to verify by inspection that Edmonds' algorithm has been implemented correctly. The Boost Graph library makes it incredibly simple to perform the subroutines needed by the verifier (such as finding all the connected components of odd cardinality in a graph, or creating the induced graph on all vertices with a certain label) in just a few lines of code. Check to make sure that mate is a valid matching on g.
Run edmonds_augmenting_path_finder once on g and mate. If it finds an augmenting path, the matching isn't a maximum cardinality matching. Otherwise, we retrieve a copy of the vertex_state map used by the edmonds_augmenting_path_finder. The Edmonds-Gallai decomposition tells us that the set of vertices labeled V_ODD by the vertex_state map can be used as the set X to achieve the minimum in the Tutte-Berge Formula. 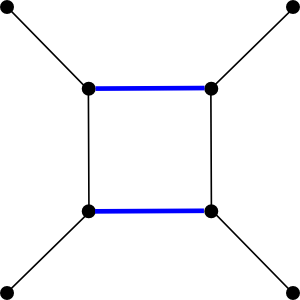 Count the number of vertices labeled V_ODD, store this in num_odd_vertices. Create a filtered_graph consisting of all vertices that aren't labeled V_ODD. Count the number of odd connected components in this graph and store the result in num_odd_connected_components. Test to see if equality holds in the Tutte-Berge formula using |X| = num_odd_vertices and o(G-X) = num_odd_connected_components. Return true if it holds, false otherwise. Assuming these steps are implemented correctly, the verifier will never return a false positive, and will only return a false negative if edmonds_augmenting_path_finder doesn't compute the vertex_state map correctly, in which case the edmonds_augmenting_path_finder isn't working correctly. The matching functions provided for you are just inlined specializations of this function: edmonds_maximum_cardinality_matching uses edmonds_augmenting_path_finder as the AugmentingPathFinder, extra_greedy_matching as the InitialMatchingFinder, and no_matching_verifier as the MatchingVerifier. checked_edmonds_maximum_cardinality_matching uses the same parameters except that maximum_cardinality_matching_verifier is used for the MatchingVerifier. and choosing the MatchingVerifier depending on how careful you're feeling. The resulting algorithm will find an extra greedy matching in time O(m log n) without looking for augmenting paths. As a bonus, the return value of this function is true if and only if the extra greedy matching happens to be a maximum cardinality matching. An undirected graph. The graph type must be a model of Vertex and Edge List Graph and Incidence Graph. Must be a model of ReadablePropertyMap, mapping vertices to integer indices. Must be a model of ReadWritePropertyMap, mapping vertices to vertices. For any vertex v in the graph, get(mate,v) will be the vertex that v is matched to, or graph_traits::null_vertex() if v isn't matched. 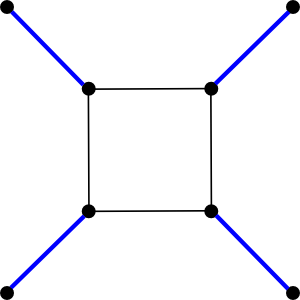 Let m and n be the number of edges and vertices in the input graph, respectively. Assuming the VertexIndexMap supplied allows constant-time lookups, the time complexity for both edmonds_matching and checked_edmonds_matching is O(mn alpha(m,n)). alpha(m,n) is a slow growing function that is at most 4 for any feasible input. The file example/matching_example.cpp contains an example.